With 20 years corporate plant maintenance, office plant care, event rentals, finer interior plantscape and plant rental experience, we know experience matters. No business too small. All plants must thrive. Our plant maintenance, long term plant rental service assures our client continuously thriving plants with flexible month to month terms, packaged to fit your needs. 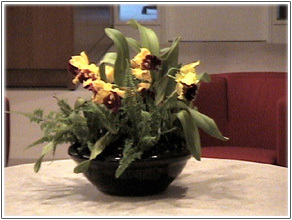 Orchid arrangements are an affordable and strikingly beautiful addition to any lobby. Add an orchid arrangement for as little as $75 per month. High quality ceramics are included in month-to-month office plant service plant lease. Office plant service is an affordable and flexible alternative for businesses of any size. 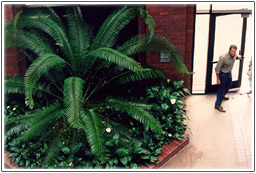 Plantman.com's indoor plant rental / leasing rates are simple, and month-to-month interior plant leasing programs offer 100% guaranteed plant maintenance with free replacements, moves and changes. 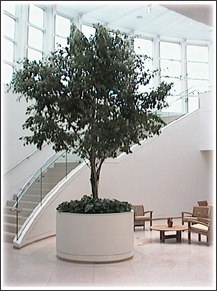 Plantman.com plant maintenance and plant rental has installed dozens of the most beautiful and largest atriums in California. Beautiful plants, plant sustainability, plant cultural factors and safety are our goals. Rent Ficus with lights, rent hedges, rent palm trees, topiaries, ferns, ivy, flowers, waterfalls, streams, ponds, bamboo, enchanted forests or jungle for photoshoots, stage, party or corporate event. Plantman's event rentals plant rentals provides plant rental San Jose, Monterey, San Francisco, Los Angeles and San Diego and in between. Plant Rental Greenhouses in Santa Cruz, Ventura and Escondido. Living Christmas Tree Rental services San Jose, San Francisco, Santa Cruz with a living (not cut) Christmas tree. Families have the same beautiful tree delivered year after year. Color accents designed with orchids or durable bromeliads add interesting highlights while controlling costs. Strategic placement of plant and tree varieties add varying height, color and textural interest. Use of subirrigation in contained plantings will help control maintenance and replacement costs. Interior plants and trees breathe, giving us oxygen and refresh the air while removing toxins and absorbing odor. Plants have a positive psychological even physiological effect by bringing an "outdoors feeling" indoors. Plants increase humidity in sealed air-conditioned office places, making a more comfortable environment and reducing static electricity. Plants provide beauty and increase relaxing ambience by offering the eye attractive colorful focal points. Purchase the prefect gift for employees or visitors for Earth Day. Dozens or hundreds of locally grown 12" Oak tree seedlings in soilless media and compostable recycled 4" wide growing container make the perfect promotional handout in the spirit of Arbor Day.